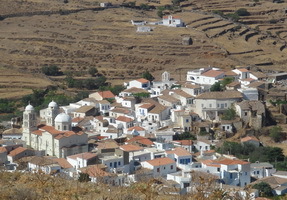 Kythnos in the Western Cyclades is a surprising island of beautiful beaches, traditional villages, hot springs, agriculture, and with a feeling that it much futher than the short ferry journey from Pireaus or Lavrion. 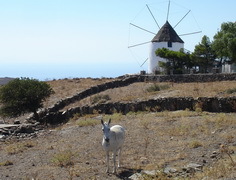 Kythnos is no secret to those who stay for the night on sailboats cruising the Aegean, since the small port of Loutra with its beautiful beach, hot healing spring and seaside tavernas is usually their first or last stop. 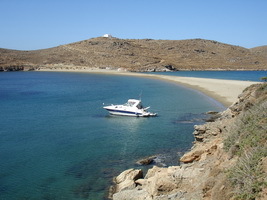 But to really see the island you need several days, a car, a mask, snorkel and flippers and maybe a wet suit and tanks. This is my guide to Kythnos. If you like this page please share it with your friends by using the Facebook and Google+ buttons and if you have any questions or need assistance please feel free to e-mail me. If you want to include Kithnos on your Greek Island holiday try using Aegean Thesaurus' Create-an-itinerary form which will enable you to choose the islands and the number of days on each, category of hotel, tours, transfers and other details. The agency will come back with a price and you are under no obligation to buy.